Let’s get some facts straight: there is no such thing as radiant barrier paint. The term “radiant barrier” is supposed to describe products that reflect over 90% of radiant energy, and these paint products simply cannot do that. The term radiant barrier has been misconstrued by the people who install the paint and it’s essentially like trying to call a hamburger a prime steak; it’s misleading and simply not truthful. For the record, both the radiant barrier spray paint and the radiant barrier foil will reflect (i.e. not emit) radiant heat. However, the fine print exists when the best available radiant barrier paint can only reflect about 75% of the radiant heat transfer. 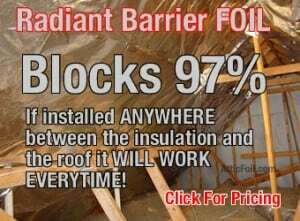 Meanwhile, the radiant barrier foil will reflect 97% of the radiant heat transfer. Radiant barrier foil is actually the best radiant barrier you can use; you can either install it yourself or hire a professional installer who uses our foil insulation. What is Radiant Barrier Paint? 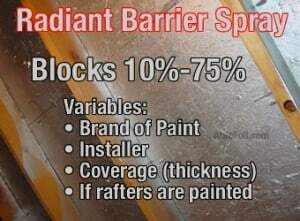 Radiant barrier spray-on paint is essentially liquid foil. While not all radiant barrier paints are the same, basically they are made by grinding pure aluminum into a fine powder and then mixing it into clear paint. Once the clear paint dries the aluminum powder forms a layer of aluminum. The best radiant barrier spray spray is only available to commercial contractors, and is an environmentally safe, water-based low-e paint called HeatBloc-75, Radiance e.25 or Lo/MIT. When the paint is installed correctly, it will reflect about 75% of the radiant heat and can be a very good product. The rafters are being sprayed completely (this usually costs more when you get an estimate). The paint is being applied with the correct coverage (many contractors put it on either too thin or too thick). The paint is not diluted. There are some contractors (even large ones who advertise heavily) that will cut* the paint with water in order to extend the coverage. *Cutting is when water is added to paint; it is cheating to cut costs. As a result, the true effectiveness of radiant barrier paint installed by many contractors is really only about 15-40% reflectivity. The typical consumer can’t tell the difference between a good installation and a poor job without testing. Radiant barrier paint spray is not a good Do It Yourself (DIY) project. The fumes are noxious, you must use a VOC respirator, a high-end airless spray rig, the proper size spray tip, and the proper pressure to get correct coverage and eliminate clogging. Forget about painting with a roller because it is impossible since there are thousands of nails sticking through the roof deck; additionally, using a paint brush to manually paint it on would take forever. Most people who try to do it themselves will actually blow too much paint and the material cost alone will be over $0.30/ft. With the cost of radiant barrier foil only being less than $0.13/ft, it’s obvious it is not only a better product, but a better deal. Many companies have developed radiant barrier spray paint. In fact, none are true radiant barriers since they all reflect less than 90% of the heat which is the definition of a true radiant barrier; technically they are reflective coatings. 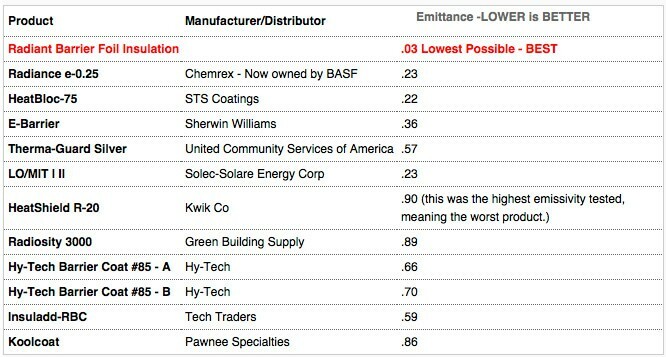 Below is a chart with some test results by RIMA (Reflective Insulation Manufacturers Association) which did independent testing on all the different radiant barrier paints. Notice that the best paint still emits 22% of the radiant heat, compared to only 3% for radiant barrier foil. Some paints claim to be award winning, although what award they are receiving still remains to be identified or significant. Additionally, the paint tests were conducted on perfectly smooth samples, applied under laboratory conditions; these conditions are different than your attic. Your attic is made up of porous wood that loves to soak up paint instead of keeping it on the surface to create a smooth, shiny film, which would be required to be fully effective. In order for paint to come close to the tested emissivity rating, the wood surface must be primed with a primer/base coat of paint first. The main reason you should consider the foil over the paint is because with the paint you are basically counting on the product to deliver results, while with the foil you are simply needing the person (which may be yourself) to get the installation done. So long as the foil is installed somewhere between the roof/rafters and the insulation, it will reflect 97% of the radiant heat. Furthermore, it is actually difficult to install the foil wrong. This is the main difference between Quality Assurance and Quality Control. You can assure that reflective foil will work; while you can only hope that the reflective coating is installed correctly. We do not sell or install radiant barrier paint; we only sell radiant barrier reflective foil insulation because it is the best. The problem occurs when reflective paint is put on too thin or when water is added to the paint/an inferior cheap paint is used. Then what? Then the customers do not get the results or the cool attic they are promised. To offset this disappointment, some companies have resorted to doing things like giving away free solar fans. Sure, if you put an attic fan in the attic it will decrease the attic temperature and could even get it close to outside temperature; however, it doesn’t matter what kind of fan it is, a fan will not stop any radiant heat transfer. A cooler attic is nice, but what we really need to do is reduce the temperature of the insulation. For more information, read our article about air temperatures versus surface temperatures and how they affect your home. In full disclosure, we are a manufacturer or radiant barrier foil, but that being said, there are still some very good radiant barrier spray installers. Unfortunately there are also some that are not very good and that is where the problem occurs, because how are you sure which one is coming to your house? Use one of the top-rated radiant barrier paints listed in the comparison chart above. Check the paint cans for factory sealed/labeled containers that are opened on site. Say “no” to premixed paint in generic buckets. Count the number of gallons brought to your house. It is hard to really estimate how much should be used, but if it is being installed so that it equates to 500-1,000 ft. covered per gallon, it will not equate to the results you were promised. Inspect the area. Physically climb back into some of the dark corners of your attic with a flashlight and digital camera. Take some pictures and see if they got the whole roof. Agree to hold back partial payment until you are satisfied, remember it is your choice, so chose wisely. Ask for a quote to spray the entire rafters with the deck included. Also ask for pricing to have them apply a primer coat before the radiant barrier paint. These quotes will give you a better comparison between the total costs of installing the spray versus the foil. Often, the price to include the full rafter and apply primer is MORE than you would pay to have the foil professionally installed. We hate to be so critical, but we have seen so many bad installations of the spray reflective paint that it is almost becoming pretty common. One of the most common questions we get is from disappointed paint customers. They want to know they can install foil under the paint. Ed (the owner of AtticFoil.com) once even had a conversation with an installer who told him that the prior company the installer worked for said that they would rather send him back on the 1 in 20 customers that complained, rather than for him to do it right with the proper amount of paint the first time. Sure it is disappointing, but this is more common than you might think.